You only get one chance to choose the right insulation! Once the drywall goes up, your decisions made about insulations are literally sealed. Choosing the right products must be done before construction begins. Once your project is ready for insulation, it's the only time the empty space in the walls and around fixtures can be filled. By choosing the right products from Priority 1, you can be sure your property will provide lasting value -- comfort, energy savings, sound control, and environmental safety. Priority 1 provides only Formaldehyde-free insulation products. 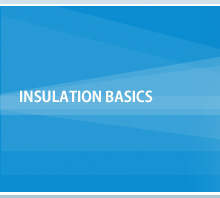 Listed below are some definitions and details about your insulation options. The first step to making the right decisions is to know your options. The goal of building insulation is to resist heat transfer. It acts as a barrier for keeping outside temperatures out and for keeping inside temperatures in. The result of good insulation is keeping buildings warmer in cold seasons and cooler in warm seasons. Heat transfer can occur in many places in a building so it is important to have a plan for covering all your bases. This type of insulation is placed between the exterior wall studs. It can come unfaced or faced with a covering product that will provide an additional thermal barrier. In addition, you will need to decide the thickness you will want for your wall insulation. The combination of a faced batt product and a thicker insulation will increase the "R-Value," or thermal resistance, the product is providing you. The higher the R-Value the more insulation you are getting. Priority 1 offers a special mold- and mildew-resistant batt product that has become very popular. This cuting-edge product uses an EPA-registered preservative that is also used on the food we eat to protect it from mold and mildew. Now more than ever it's important to do all you can to protect yourself from mold and mildew. Priority 1 also offers Fire-Resistant Batts for the areas of your project where building codes require it. This type of insulation is placed against your concrete foundation walls. It comes faced with a special puncture-resistant polypropylene thermal covering. It is installed in larger sections to cover more surface area of the walls. If your basement is going to be unfinished, the puncture-resistant product can even be left exposed where building codes allow it. Finished basements, too, will be covered with drywall just like your normal living area. This type of insulation is similar to the traditional batt wall products and can be used for both thermal insulation and sound insulation. Some floors are exposed to the exterior environment and need to be insulated. This product is rolled out between the floor joists. It can also provide an efficient sound barrier to interior rooms where there are special needs (e.g., bedrooms, playrooms, etc.). Attics and other overhead open spaces are typically addressed by blowing into the space a thick blanket layer of insulation. Heat rises, and this is where you need the best protection. Priority 1 uses a white, unbonded, non-combustible, moisture-resistant, fiber glass blowing wool insulation to get the job done. This provides a seamless blanket of coverage and R-Values ranging from 19-49. Your only decision here is the thickness you desire. This type of insulation provides the best protection for sure. For new construction it is sprayed in and expands 100X its origianal state to fill in all the spaces it can reach. It expands around wires and pipes, and fills in all holes. The excess is cut away in minutes. Spray foam is ideal for attics, floors, overhangs, basement joist pockets and crawl spaces. Priority 1 does not presently install injection foam in finished walls or ceilings. This type of insulation is used in a limited way where other insulation options are now necessary. It offers the least amount of thermal resistance, but it also occupies less space. It is a rigid foam board bonded on each side with special facing. This product is easy to cut and hang.